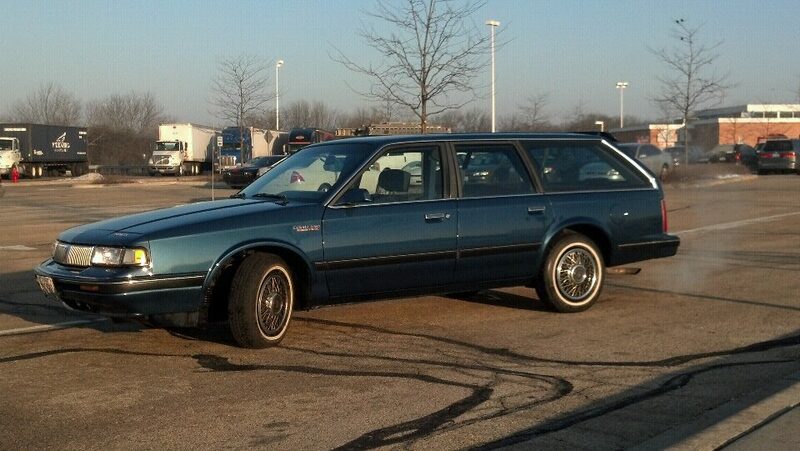 Our first Olds Cutlass Cruiser. It’s strange how we can instill heart and soul into material objects. Because of that, this is a wistful moment, bidding farewell to a member of our family for over 25 years. 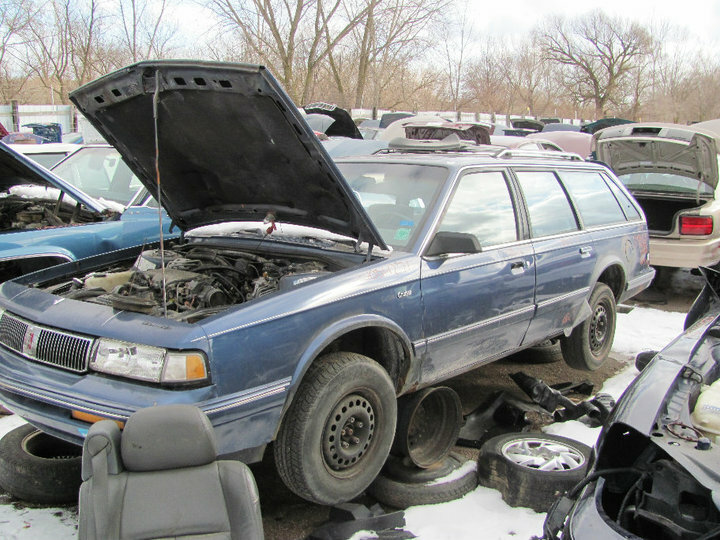 Back in 1990 when we bought our home, the real estate agent said, “Hey, you have a few dollars left over from your loan, why don’t you buy a car?” So we acquired a brand new Oldsmobile Cutlass Cruiser, a mid-sized station wagon. 330,000 miles later, here we are, standing beside Blue, who is resting quietly in the driveway. You may think it is a stretch to give a soul to a machine, but it is not uncommon. Sea captains adopt their boats. Hearst had his Rosebud, and Davey Crocket, his trusty rifle Old Betsy. Blue, fresh out of the shower. A rare talent: a 4×8 sheet of plywood through the window. Actually, Blue is resting on the driveway, not in it. Family only goes so far. The reason why this departure is so touching is that we remember when we first got Blue. We traded in an earlier Olds wagon, the exact same model. The paperwork took much longer, but by the next day we had Blue. 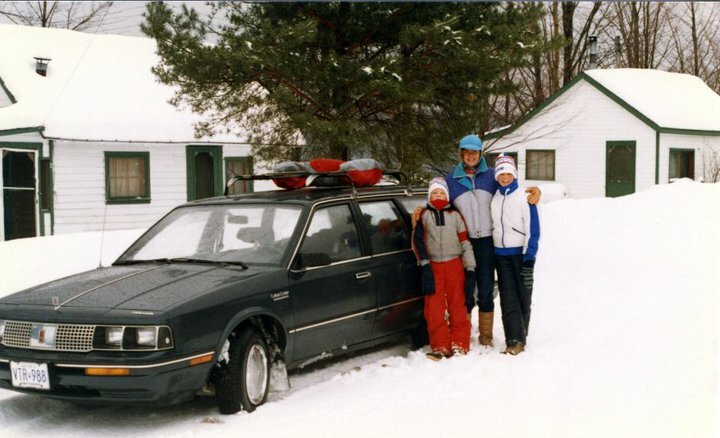 Years later there’s no need to recount all the outings and family trips in Blue, but the car distinguished itself by its steadfast performance. According to industry stats, Blue must have been made on a Wednesday, because he never suffered a quality issue. Beyond the normal R&M costs, Blue lived a clean and pure life. It was not until 14 years later, on a mild December evening in 2004, that we truly realized what a prize Blue was. 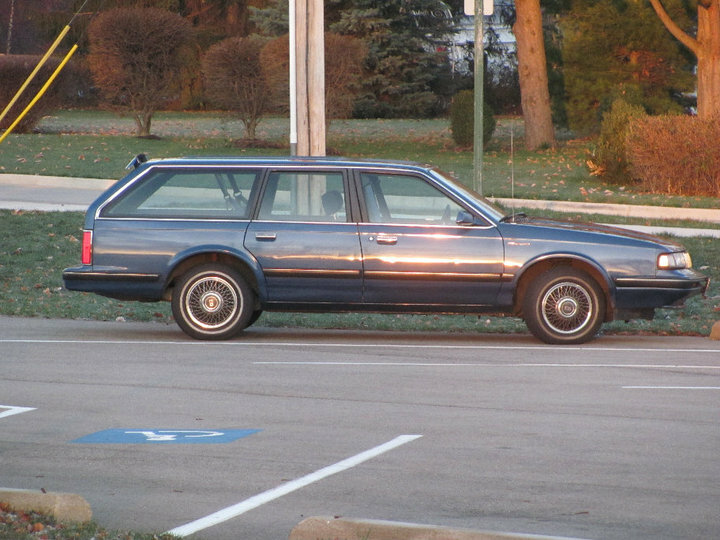 We had parked outside a restaurant for dinner, and walking in, spied a similar Cutlass Cruiser wagon, same vintage. Rear view treat: the seat of choice. And here sits Blue today, well past the mark. With a few makeovers mind you. We have repainted Blue four times. Maaco gives us respect, though honestly, the owner there may have succumbed to paint fumes. On two different occasions we returned after a week to pick up Blue as scheduled, and he couldn’t remember us or the car. Varmint duty: airing out after trapping a possum. But the new paint jobs breathe new life, just like a new suit, new carpet or a new kitchen. People would stop to stare at Blue. We never viewed Blue as feminine, but protocols demand the female gender for cars it seems, just like Pat Brady’s Nellie Belle. You bet it does, kids loved it, but the D.O.T. put an end to that hazard, understandably. Still, it was fun. The pitt crew: Don and the team. 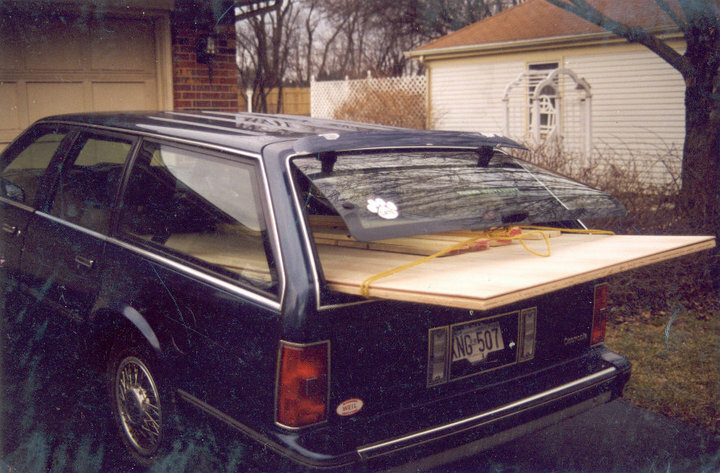 But what Blue could do with its backseat and rear window was pack in a 4’x 8′ slab of plywood, thanks to General Motors’ patent on the hatchback window. You can find the same feature on Cadillac Escalades today. Unfortunately for Blue, General Motors lost its way, and designed a long series of geriatric, goofy looking Oldsmobiles through the 90s and into the new century. Sales withered, and April 29, 2004, the last rolled off the line. 15 minutes of fame, and a year’s free oil changes. “We would be remiss, however, not to suggest that you look closely at our new Cutlass at your local dealership….” That was three years after the demise of the Olds make. We wonder today if Adam is in a small cube somewhere, still writing optimistic notes to holdouts like me. In summer 2009, Blue was worried. The CARS program lurked. Car Allowance Rebate System, popularly known as Cash For Clunkers, was the federal government effort to compensate GM and others for turning out a decade of lemons. To the automobile, this was like plague, emerald ash borer and mad cow disease, all rolled into one. Blue’s worst fear: to be stripped at Pick & Pull. All told, the feds grabbed 671,000 vehicles off the street. Blue wasn’t one of them. As a celebration, Blue had his own Facebook page. It was revealing, listing his favorite movies, shows and songs: Bullitt, Dukes of Hazard, Knight Rider and Deadman’s Curve. January 2011, the miles continued to climb as Blue enjoyed continuous 100-mile round trip sprints to the office every day. 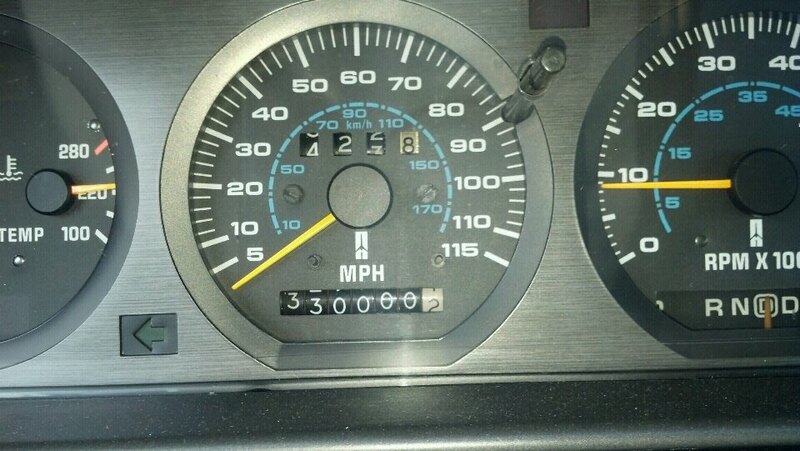 300,000 loomed ahead on the odometer. 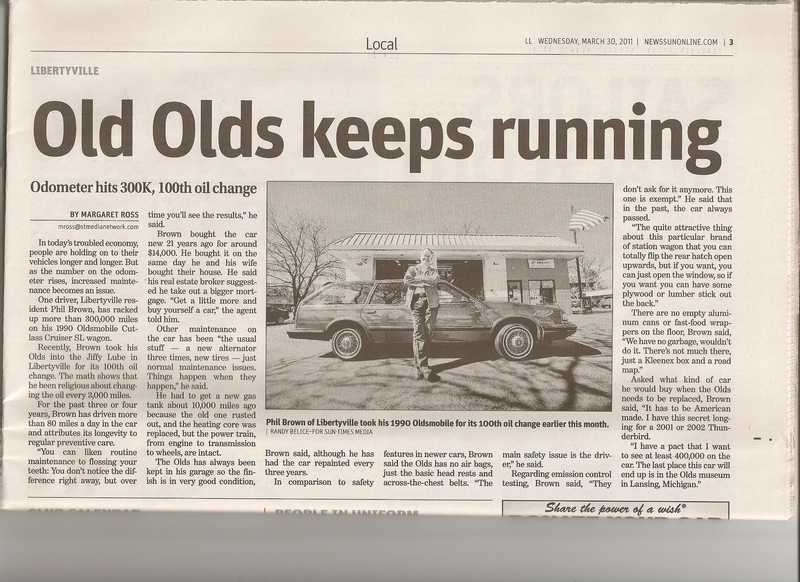 We contacted Jiffylube, which had been Blue’s choice since May of 1991, mile 5991, 20 years earlier. They sensed a PR opportunity when easy math showed a century of oil changes: 100 visits. 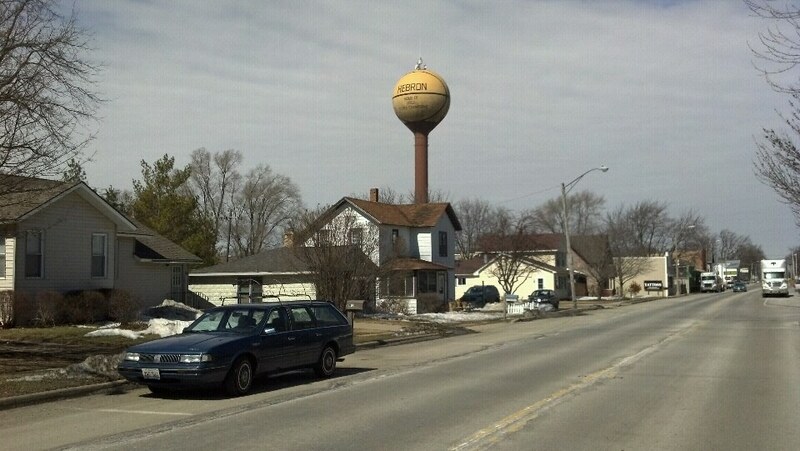 Under the State Champs water tower, Hebron, IL. 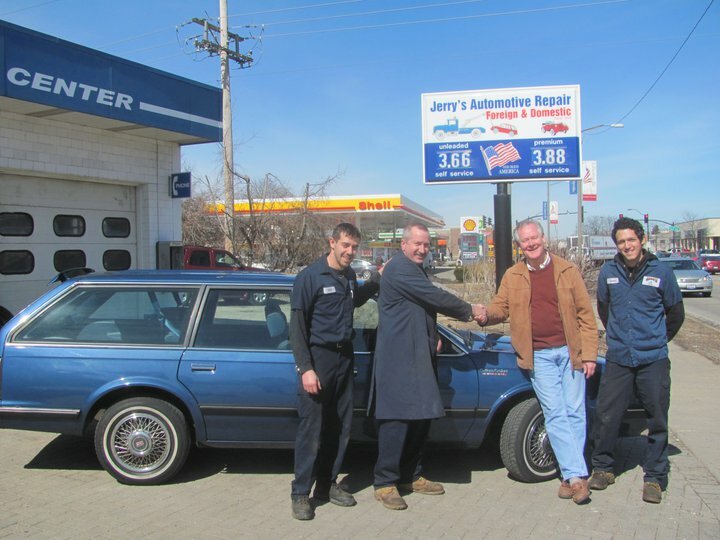 Jiffylube’s ad agency jumped on Blue and he had a day’s coverage in suburban Chicagoland’s news, taking interviews from reporters and an FM station in Dubuque. Best of all, a gift of free oil changes for a year. Celebrity is emboldening, if also a heavy responsibility. 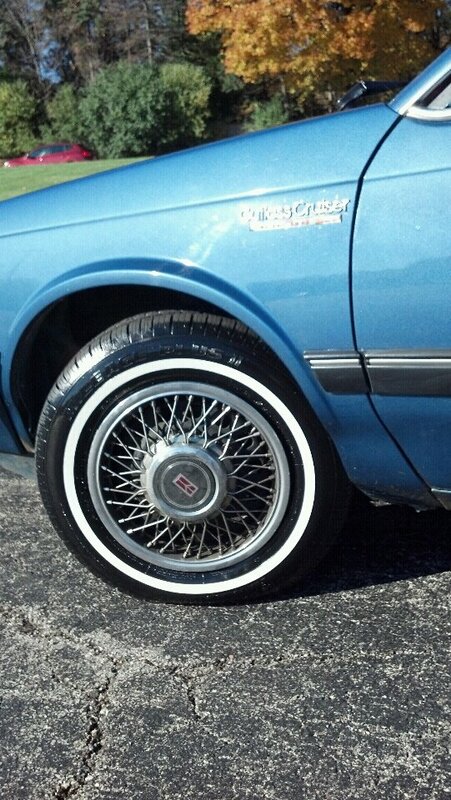 We bought Blue a new set of tires, with the slim whitewalls to complement his spokes. The daily commutes were Blue’s opportunity to let the ponies go. There is a 4-lane strip of highway north of Chicago where we pushed the speedometer over two digits a number of times. Only for a mile, but long enough to let him smell and feel the brisk air screaming through the rad grill. A ride in the country, Lake Como, WI. Then last week, a new wobble. Driving out for a visit to the hardware, Blue couldn’t make up his mind on which gear he was in. 3rd? 2nd? Drive? We got him home by slipping into Neutral at every brake and corner, just to keep the revs up. He wouldn’t talk about it. When we pulled the hood release to check the engine, the wire snapped, locking us out of a closer look inside. Blue was suffering his pain quietly. At mile 332,879, the automatic Hydra-Matic transmission that was perfected by Oldsmobile in 1939 was out of the race. Our worst fear is that Blue could end up in the jaws of a car crusher at some junk yard. It is unpalatable. Better to hide under a tarp in a barn. Sunset, Butler Lake in Libertyville, IL. So we are hanging onto Blue, and will nudge him past 333,000, maybe with a trip or two to the golf course, or to a grassy park overlooking the tollway, where he can hear and smell the noise and speed of the thousands of cars that whine and hum along the lanes below, unaware of his watchful gaze. It’ll be a sunny, breezy day. Thank you Lynn! You need to take all the pics you can. 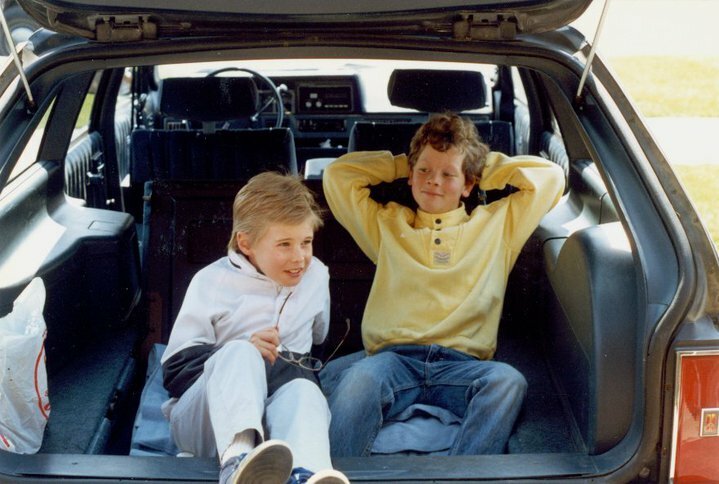 The kids grow up, they go away, and leave you with empty rooms… and a car. Thanks for writing! Hey Phil….a beautiful story of love, memories and appreciation which I especially connected with and will now have to re-consider my next move with my 1998 Buick Le Sabre with 220,000. Going great except for one non working electric window (3 fixes) and a non working AC (3rd rebuilt). I had started to shop for a cross-over and narrowed down to Buick Encore or Nissan Rogue which would go to Hortencia. I would take over her 2010 Nissan Altima at 74,000 miles and going strong and finally say farewell to the Buick. We now make 2 roundtrips to Florida every year which is good for about 5,500 + lots of additional mileage there. The Nissan will quickly get up there so I’m trying to stay ahead of the game. Like you I don’t put on much mileage these days and could well stay with the Buick but Hortencia will need a new one this year or next so what to do short of owning 3 cars? You’ve given me pause and thanks for that. Best regards to Jane. Allan. Hi Allan! Thanks for writing. We have a Buick LaCrosse. Awesome car. We have logged 49,000 miles since May 2013, 27 months. We are driving to FL ourselves. 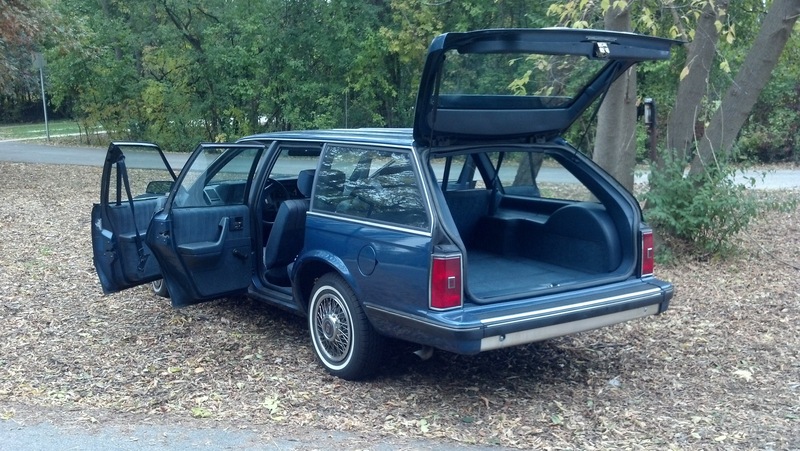 I hope someone on Craigslist will buy Blue for the body. Don says a new transmission and a head gasket job would do the trick. I can see Blue low-riding Hollywood someday. Hi dan! Thanks for writing! You have had the pleasure of riding in Blue. Another achievement! Nice to know old Blue is resting comfortably with family. If he blew a leg, you wouldn’t shoot blue, would you? A lot of people who get a new lease on life with a simple knee or hip replacement. Perhaps, the same can be said for Blue. 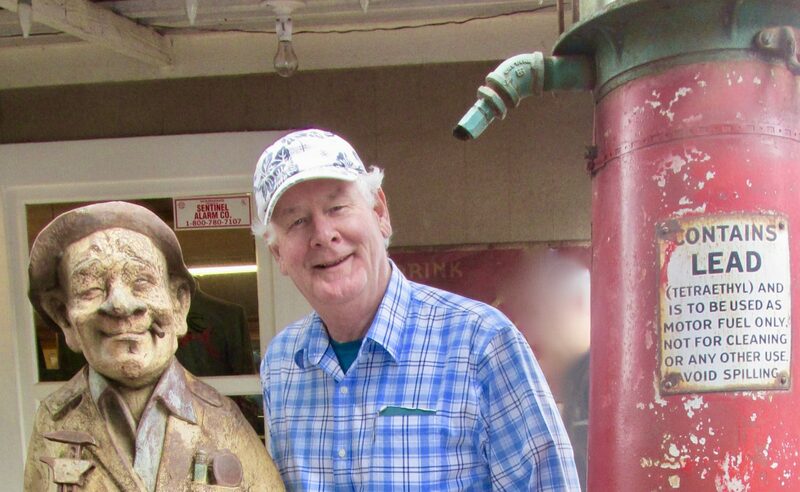 Heck, maybe there is still a donor Olds in an old salvage yard waiting to offer a transplant. Hi Gordon! Thanks for writing. I have in fact had a couple inquiries from Craigslist. 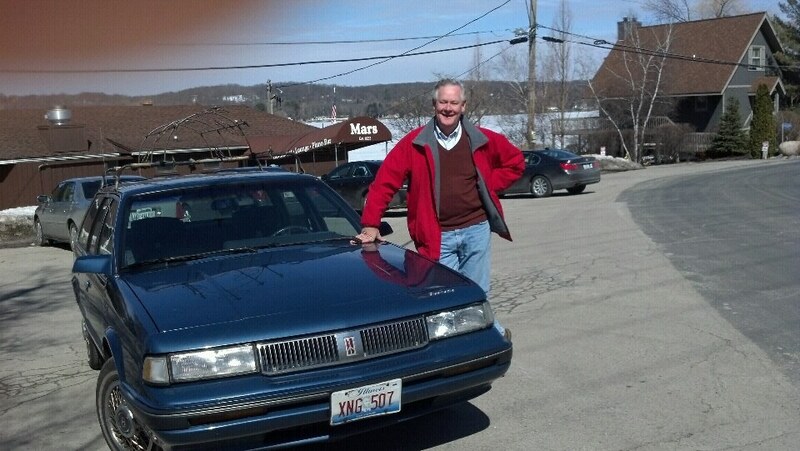 There is an Olds following out there. Hopefully we will find a hobbyist who wants to give Blue a new life. Maybe we will see h at a car show one day. Nice article Phil! I’ll bet Blue has a close relative somewhere in Cuba! Hi Bob: I always enjoy looking at the Cuba news on TV because they never fail to show at least three or four Chevys and Oldsmobiles. Those are 50’s vintage, and at least two generations older than Blue. But in either case, indomitable! Hope you are doing well. Thanks for writing! I received this email today from a reader who was Googling for Olds parts and ended up on this page. Just today I discovered your stunning article about your faithful friend “Blue”. “My God, that’s a wagon?” Until that time, wagons had been kind of frumpy and boxy. of design and technology. It proved wagons could be elegant, sophisticated, classy, modern, and head-turning. had obviously been wrecked at some point, as it had the complete 1985 front end. I loved it, as the 1985 front end is my favorite. I cannot thank you enough for your passion and your story. It is one that needs to be heard. Cars are so much more than appliances. They are perfect companions and have a heart and a soul. You my friend, must be my kindred spirit. I regret that the 2008 recession precipitated the Cash For Clunkers. We lost a whole generation of classic cars in the name of fuel economy. You should know the rest of the story of Blue. One day he died in the middle of an intersection. That was a sign that things weren’t good. After a visit to his mechanic, I was advised that age and reduced high-usage was deteriorating the works. I had retired, and was not making my daily 120-mile round trip commute. I sold Blue to a collector who was beside himself. He took Blue away in a trailer and constantly updated me on the refurbishments: new A/C, new manifolds, new wheels, new life. I was on his Text favorites list. Then one day his son took Blue out on a wintry rescue mission somewhere and slid into the side of a bridge in the country. While Blue wasn’t totaled, the new owner was heartbroken, and again texted me to apologize. That was almost a year later. Anyway, he again fixed the car to brand new. The problem for him was that his wife, a lady from the far east, told him Blue was now cursed, and could no longer stay on the property. He was sold to a distant relative in Milwaukee, and I am told that Blue is now delivering flowers there. Sounds poetic enough; I hope it’s true! I also have a female star who drove a 1990 Cutlass Cruiser, and that is Deidre Hall, the single mom in the TV series “Our House”. Wilfrid Brimley is her live-in father-in-law. I have a video of her in the car, and I will see if I can send it along. Incidentally, she is 71 years old and still on TV as of 2016 for Hallmark. She is a 1995 and only has 54,000 miles on her. The drivers side needs to be repainted and new woodgrain installed. but to finally own one again… Daily, I am doing little cosmetic things here and there to restore her to her original glory. I hope you enjoy your virtually new cruiser. As a matter of interest, I sold Blue to a mechanic/collector who had her up and running in no time with new wheels. Then on a wintry Chicago night, his son drove it into a bridge. Quite upset, the buyer informed me that he had it totally repaired. Unfortunately, his wife had a belief that crashed car had bad spirits, so he gave it to his brother in law in Milwaukee. Last I heard, Blue is still there, delivering flowers. Surely close to 400,000 by now! Thanks for writing, and all the best!